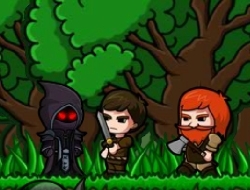 This is a great adventure game in which you will play the role of the Summoner. You will have to conquer the kingdom and become the ruler of all land. Use your powers to summon skeletons, zombies and other creatures to fight for you, but remember to also use your damage skills and cast them where the enemies are stronger. That will cost you mana, but you can regenerate it with evey enemy killed. After each location that you have passed you will get to learn a few spells from an ancient book. Each will have its benefits and it is up to you to use them in the heat of the battle so you can survive and defeat all your enemies. Use the mouse to aim the skills and the number keys to cast them. The Summoning 0.00 between 0 and 10 based on 0 votes.